Meet Ensure "nutrition shakes," one of the most spectacularly selling fake foods in America. $1 billion in sales in 2009, and growing. Bought by seniors in the millions as meal replacements. Used to supplement the diets of picky children. Hawked as a solution to build muscles, meet nutritional needs, fortify calcium, restore vigor, aid recovery from illness and surgery. And at 250 to 300 calories per bottle... same as a Snickers candy bar... one serving is not an adequate meal replacement for most adults or children. "Ensure claims to contain nutritional ingredients which aid a person’s normal diet, but the ingredients contained are mostly synthetic or chemical substances with little proven benefits for dieters. "The actual nutrients — namely, Vitamin A and Vitamin D3 — are also listed in the lower half on the ingredient list, indicating it is used in smaller doses in comparison to the rest of the ingredients. These ingredients, if used in larger doses, may have provided nutritional benefits to dieters who are not able to eat a sensible plan, but the lower dosage may lessen these benefits. "Furthermore, any diet-related benefits could not be located. It appears Ensure may match the caloric content of an average meal (say, 300 calories or so) but as a nutritional supplement, may not contain the amount dieters may desire for optimum nutrition." "... the top two ingredients in Ensure are almost identical to the top two ingredients in soft drinks! ... the top four ingredients (are): water, sugar, corn syrup and maltodextrin. That's basically three sweeteners and water. So if you were trying to be funny, you could call this product 'sugar-sugar-sugar-water,' because that is primarily what it's made of, according to the ingredients label... So essentially, what you have here with Ensure, is a predominantly sugar-water product that has been fortified with a few vitamins and minerals. "Products like Ensure or SlimFast seem to imply that they are serious products for optimum nutrition, but in fact, an honest analysis of these products reveals that they offer extremely poor nutrition and they probably do far more harm than good to people who choose to consume them on a regular basis, as any good nutritionist will tell you." "A major concern for anyone taking medication is the possibility of an adverse interaction with the ingredients in Ensure drinks. This includes prescription drugs and over-the-counter drugs or supplements. Such interactions might weaken or heighten the effects of your medication. Interactions also can cause damage to the body or disrupt its functioning in some way." Real foods don't cause such symptoms, health complications, and adverse reactions. Chemicals and drugs do. 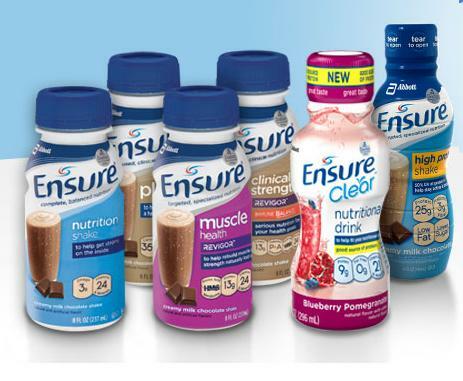 Ensure is a complex chemical concoction manufactured by a big Pharma corporation, dunked in sugar and water, and aggressively marketed as a wonder tonic for health. A better, healthier solution than drinking an 8-oz bottle of Ensure? 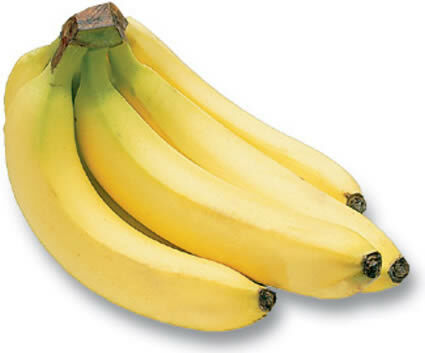 Eat a banana, and take a daily, natural multi-vitamin. Skip the chemical-laced sugar water. Wow. And doctors are still recommending this stuff. I know, because it was recommended to my dad over and over again. Wow, I fell for this one. After having my wisdom teeth out and being told to drink only liquids, I stocked up on 4 bottles of the stuff. Obviously, there's no really great way to get complete balanced nutrition from liquids, and it's not like I drink these on a regular basis (those are the only 4 bottles I've ever drank) but I admit that my perception was that I was enjoying a protein-and-vitamin enriched super-broth of some kind. It's not meant to replace real food - nothing can beat that. All nutritional shakes, be them Ensure, Boost, or Store Brand, are great for those of us seeking extra nutrients due to being sick and not having proper meals for example. I use it in addition to meals, not instead of, because my meals don't give me nearly enough calories or nutritional value a day. Actually there are nutritional shakes that actually meet real food nutritionally. This product is big pharma big Corp profit maker. It's given to Dr's to pass out and recommend to the gullible masses. Most family docs are not nutritionists. I wouldn't give this to my dogs literally speaking. Although Ensure may not be meant to be a meal replacement, I suspect many seniors use it this way. It is just so easy, and sugar is highly addictive. My mom has recently moved in with us, after living three hours away. Now that I am her daily caregiver, this is what I observe. She is adverse to any food but Ensure, and craves them. We have to beg to get three mouthfuls of food down at a meal. She has raging diarrhea, within which are found hard rice-like pellets of actual turd. Ensure coats its bottle; it hardens in the air into a hard plastic-like substance. It is also coating her stomach and intestines so that she can NO LONGER DIGEST SOLID FOOD. Thanks for this great article. Came here looking for an ingredients on Ensure and discovered this. Some of our customers were taking this and we needed proof this stuff was bad. Now we have it. I would like to know why it is banned to be sold in Mexico; what do they know that we don't? WRONG. It IS sold in Mexico in all the stores, Costco, Sam's Club, Walmart, Mega Mercado and all pharmacies. I know because i live in Mexico. I have been rescuing dogs from the street for over 20 years in Mexico. I need some help. Please take a peek at my webpage. thanks.You can help: http://www.gofundme.com/4ej3ic . This pharmaceutical conglomerate is a lobbyist in the US government, that is why the FDA approved and allowed it for consumption (especially for senior) nationwide. I was addicted to smoking, so when I decided to quit cigarettes, I bought a nicotine spray from Happy Health UK and gradually switched to vitamin sprays available in tasty options. Now, I have got rid of the habit of smoking completely. Great expose report on Ensure. They're nothing but a bunch of snake oil peddlers. 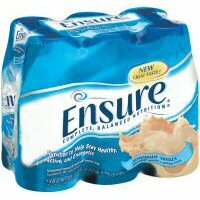 You do know that Ensure is used for people that can't eat. I'm using it now because I can't swallow solid food. Can't even swallow pills. What would you have me do to get nutrition? There are healthier nutrition shake options available, with more bioavailable vitamin and minerals used in their composition. Not all vitamins are created equal. I personally use Shaklee's loose powder to together with almond milk (to avoid hormones) for supplement shakes. Their vitamins rank very highly, and I can actually feel improvements to my mood and overall health when I use their products. There *are* reputable quality brands available, but you must be weary of the majority. Take a look at the site I have linked for a starting point. I think it should be helpful in finding a better source to supplement with.